Once Upon A Time … a very long time ago, an interesting clan called Kagga Kamma and the Cederberg area home. The clan, known collectively as the San (or “Bushmen by some) were a group that were known for their hunting, foraging/gathering and symbolic paintings on cave walls. Their mantra was to live in harmony with each other, with nature and always humbly giving thanks for anything they received. Although the San people have moved on from Kagga Kamma, there is still evidence at the Reserve of them once living here and the group is still in existence today with the same beliefs, skills and habits of their forefathers. The San people who make caves, rocks, over hangings and even temporary huts their homes, are certainly a group of people who have many interesting hacks, a remarkable culture and a serious spiritual connection with the Eland. See the six interesting facts you need to know about the San below. The San people, unlike most other African clans, have no official chief or leader. Instead they govern themselves through group consensus. So if a fight or dispute happens, lengthy discussions are held until the issue is resolved. Individuals might naturally become leaders in certain areas; like if a member of the clan is the best hunter he or she would naturally become the leader of hunting. Also fascinatingly, gender roles are not fixed in the San culture like so many other cultures– some women hunt and some men forage. The San’s weapon of choice when hunting is the bow and arrow. But instead of having standard arrows in their quivers, they make theirs poisonous or at least the arrowhead contains poison. So the animals they hit are not killed by the actual arrow but by the slow release poison on the arrowhead. This means that the San have to track the animals they hit for a couple of hours in the case of small antelope, several hours for larger game and for something as large as a giraffe, days. The San are also smart about where they put the poison – it isn’t put on the tip of the arrowhead, which would be fatal if they by mistake cut their fingers on it. Instead it is put on the sides and more often the back of the head. What do the San make their poison from? Beetle larvae, poisonous plants, caterpillars and sometimes even snake venom; this is boiled until it makes a toxic jelly substance. What is also truly amazing is that the deadly mixture only affects the area where the arrow hits – the rest of the animal is safe to eat. The San hunt together and the members who successfully track and kill an animal distribute the meat as they see fit. So meat is shared amongst the clan. The San women (and some men) are expert foragers and know thousands of plants, which are mainly gathered to eat or for medicinal purposes. Interestingly, foraged items are not shared with the clan like the meat is – but it is only shared with the immediate family. San art is often found inside caves or on outcrops; what might look like mere stick figures at a glance is actually art with deep spiritual and religious significance. One of the most painted animals and the creature with the most spiritual significance, is the Eland (a large antelope). The Shaman (“Medicine Man”), when painting the Eland on cave walls, is not just simply paying homage to the sacred creature, but harnessing its essence. Painting actually is a ceremonial act, which in the mind of the San opens a portal into the spiritual realm. Many of the paintings are done in a reddish-brown, orange, white, yellow and black. Kagga Kamma actually has numerous sites and a guided tour where visitors can check out some of this rock art for themselves. In general, the San believe in one powerful god and have a few lesser gods. Remarkably, one of the most important spiritual beings is /Kaggen –his name can be translated as meaning “Mantis”. This name and translation possibly stems from the legend that this god manifested as a praying mantis before. But /Kaggen, often known as a trickster, manifests in various forms, not just a mantis. This praying mantis business has led to a few people inaccurately believing that the San worship the insect. Moving away from then insect story…the San also believe it is important to pay homage to the dead. The eland is a very spiritual creature to the San (as mentioned above). There are four rituals where the Eland plays a central role – boys first kill, girl’s first menstruation, marriage and during trance dances. A fascinating ritual happens during the girl’s first menstruation – the girl is isolated in her hut, the San women dance around the hut and enact the Eland cow’s mating ritual; the San men act like the Eland bull with “horns” on their heads. This elaborate dance is to keep the girl beautiful, peaceful and protected from hunger and thirst for the rest of her life. It seems we have much to learn from the fascinating San culture and people. 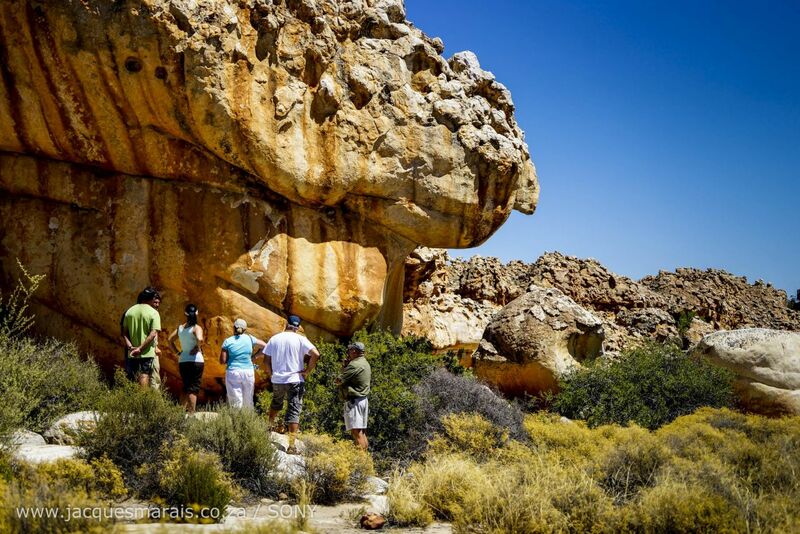 To learn more about the San people and see rock art that possibly dates back thousands of years: visit Kagga Kamma for an informative Rock Art Tour.